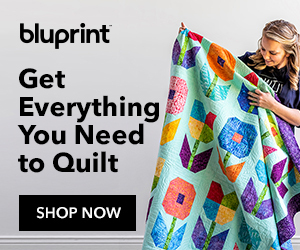 My first quilt – the 9-patch! It’s been 13 years since I completed my first quilt and I still love this little 9-patch. It’s a doll-size quilt as you can see…. Our puppy, Cooper, is curious about the new visitor (Baby Bitsy). I thought I would share a few tips on making this one. I started with (3) 2 1/2″ wide strips of blue fabric and (3) 2 1/2″ wide strips of yellow fabric. I sewed them into strip sets and pressed towards the darker fabric. Then I subcut them into 2 1/2″ wide segments and laid them out to form the 9-patch. I placed the first two segments right sides together and pinned the seam intersections on both sides of the seam. You can also use just one pin and pin it at a diagonal. Then you stitch the remaining segment onto the other side just like before and you will press your seams toward the outside. Your block should measure 6 1/2″ square. If it’s bigger than that, then your seam allowance is too scant and if it’s smaller than 6 1/2″ square, then your seam allowance is too big. Also check to make sure that you have pressed your seams flat. You can see my tutorial on the perfect 1/4″ seam allowance for more information. I pressed my seams toward the plain squares. Then I stitched my rows together and added a 2 1/2″ wide border to all sides. The “proper” way to add borders is to measure your quilt top through the middle and along both edges and then take an average of those three measurements. Cut your first two borders to that measurement. This step helps to keep your quilt top “square” and prevents your borders from becoming wavy. Since this is a small quilt, I chose to cheat a bit. Rather than taking actual measurements, I laid my border strips across the center of my quilt top and cut the borders even with both edges. After sewing the first two borders on, repeat for the remaining two border strips. I pinned my borders in place and then stitched. If you have a big quilt, it’s a good idea to mark the center of your border strip and the center of your quilt top and match both centers and pin. Match the ends and pin, and pin in between as necessary. Press towards the outer border. After adding the dark blue borders, I added the final border (4 1/2″ wide). I love the butterfly fabric, don’t you? It’s been in my stash for a while. Love using up my stash! Next step: basting the quilt top, batting, and backing together! I’ll be back to share my favorite way to baste soon.